← FEMALE INCUBATING GUARDS HER CLUTCH. All of these lovely feathers–such a cozy place to come out of the environment of a shell to this softness and caring of the tree swallow parents. Son tiny–so in need of care and protection of a nest. 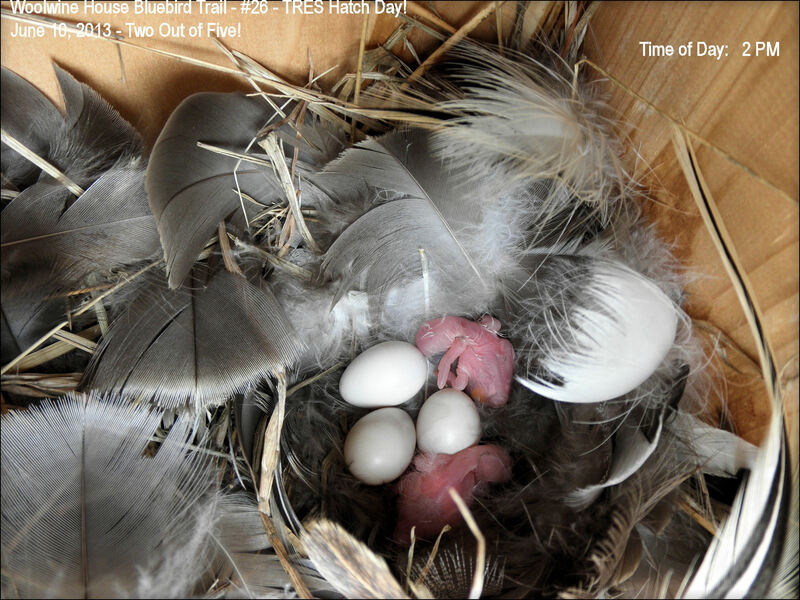 Here is my first Tree Swallows on the trail–hatching started June 10, 2013. I’ve waited a long time to have this species nest on my trail. I hope they do well. Great photos! I have four bluebirds that size that hatched yesterday. One egg to go. Five successfully fledged from first brood, only losing one to glass strike. Here’s hoping. Was not brave enough to photograph! Congratulations! Really? I thought you wanted to keep everyone but bluebirds out. Please explain. Where did you get that idea? For sure, all native birds can use the boxes, not just bluebirds. If you read the PURPOSE-HISTORY page, you’ll see I write about that. There is a new tabbed page on welcoming all native nesters. I also post stories and pictures of other birds nesting, including the non-native House Sparrow which I do control reproducing in manmade boxes. If you can find for me where I mention only bluebirds, please tell me where that is so I can correct it. Thanks.